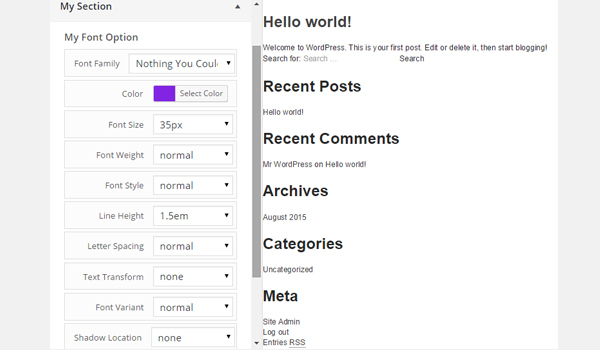 Allowing an end user to change the font of your theme can be an intimidating task, especially when you want to provide this option inside a custom admin panel, a metabox, or even the theme customizer. 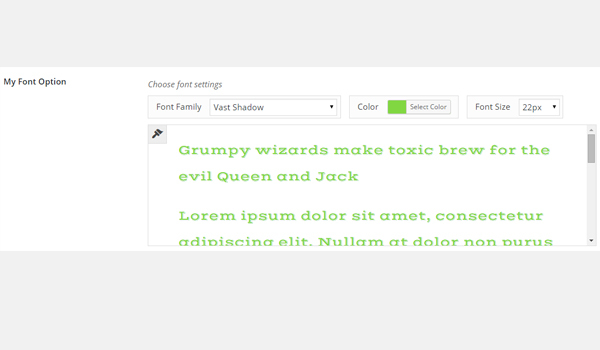 Today, I'll discuss how to add a custom font type option via Titan Framework. name: (string) It defines the display name of the font type option. id: (string) This parameter assigns a unique name which helps in getting the values. desc: (string) It displays a brief description. default: (boolean) In the font type option, this parameter behaves somewhat differently. 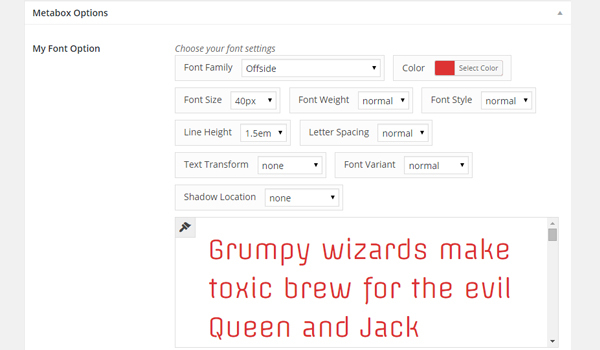 It takes up an array which contains some default fonts and styles you want to use (more on this later). css: (string) When you add this option inside an admin page and/or theme customizer section, this parameter automatically generates CSS (more on this later). Finally, there is a long list of certain check-based parameters, whose default values are set to true. Let's name them and find out how they'll behave if set to false. show_font_family: (boolean) The font-family section disappears if this parameter is set to false. show_color: (boolean) The color palette is not shown if this parameter is set to false. show_font_size: (boolean) The font-size option disappears if this parameter is set to false. show_font_weight: (boolean) The font-weight option disappears if this parameter is set to false. show_font_style: (boolean) The font-style setting disappears if this parameter is set to false. show_line_height: (boolean) You cannot change the line-height if this parameter is set to false. show_letter_spacing: (boolean) You cannot edit the letter_spacing if this parameter is set to false. show_text_transform: (boolean) The text-transform option disappears if this parameter is set to false. show_font_variant: (boolean) The font-variant field will not appear if this parameter is set to false. show_preview: (boolean) You will not see the live preview of the font if this parameter is set to false. show_websafe_fonts: (boolean) The list of websafe fonts disappears if this parameter is set to false. 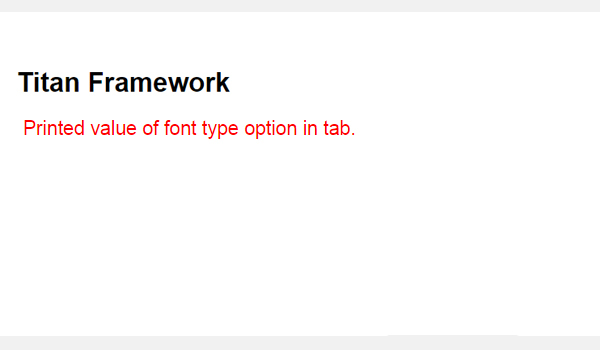 show_google_fonts: (boolean) Google fonts are not shown if this parameter is set to false. include_fonts: (mixed) This is a regex string which specifies the fonts you want to add. enqueue: (boolean) If set to false then the Google Font (if used) will not be enqueued automatically. The scope of this article is not about the creation of these containers. You can refer to my previous articles if you want to learn about that. First get a unique instance via the getInstance() function. In the end, get saved values via the getOption() function. Let's create this option inside an admin panel. I've used the createOption() function (line #7) to add a font type option in an admin panel $aa_panel. This function takes up an array of parameters. That's why parameters like name, id, type and desc are used here. The value of ID (i.e. aa_font) should be unique because it gets the saved options values. In the above screenshot, there is a font type option named My Font Option inside an admin panel Neat Options. 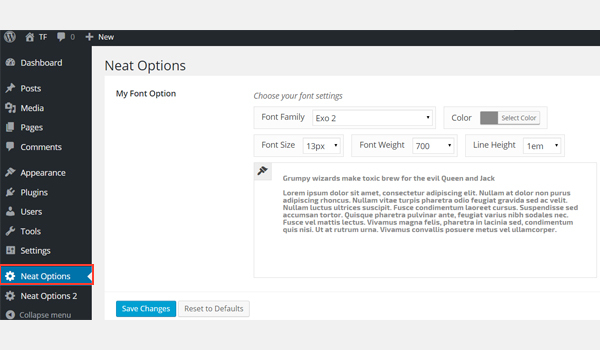 There are several setting options which can be set to configure the font settings of your web development project. The process of getting the saved values is pretty much the same one that has been discussed in previous articles. In line #3, the getInstance() function is used, which takes up a unique parameter, preferably your theme name (i.e. neat in this case). Next, I used the getOption() function (line #6), which gets the value via the ID aa_font, and then I saved it in a new variable $aa_font_array. Previously, we established that the font type option takes up an array of parameter settings even if we don't define them in reality because their default value is set to true. So, before I display the retrieved values at the front-end, let me print this complete array of parameters. 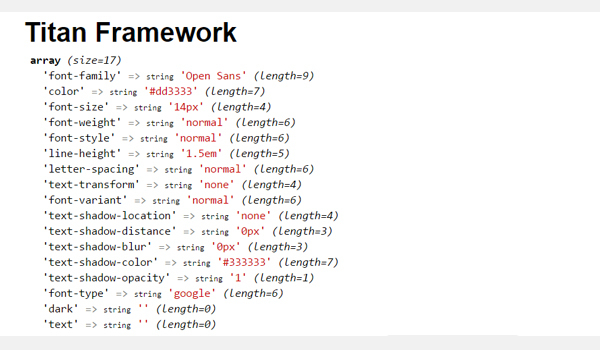 In the above screenshot, a detailed description of every element of an array is listed. 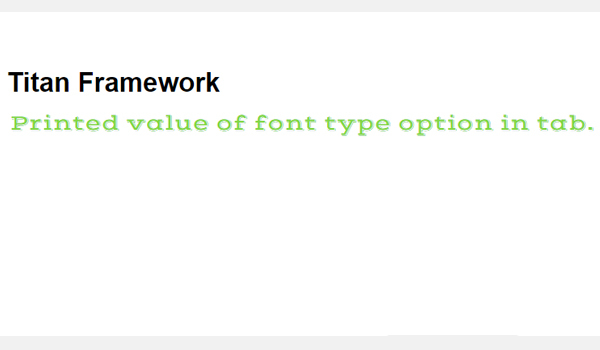 It clearly explains how the font type option in Titan Framework is set. Now this part was just an additional thing—our main goal is to change the default font settings and print it at the front-end. In line #7, I've used inline CSS styling inside an H3 (heading 3) tag. The value corresponding to the style attribute, i.e. font-size, gets printed at the front-end. The printed text is currently 14px in size. Let's change this value from our dashboard and preview the result. Suppose I set the demo value to 30px. An increased font-size of the text is seen clearly. This way you can enter any array element in line #16 of code and preview the results. Let’s create a font type option in a metabox which has all the style fields in it. I added a font type option with ID aa_mb_font in a metabox $aa_metbox via the createOption() function (line #8). It appears against the name 'My Font Option'. Here is the screenshot, where you can find My Font Option inside a metabox displayed at the end of a page editing screen. This is a custom metabox which I've created with Titan Framework. Refer to my previous articles to learn how. * Get Option Value of metabox. 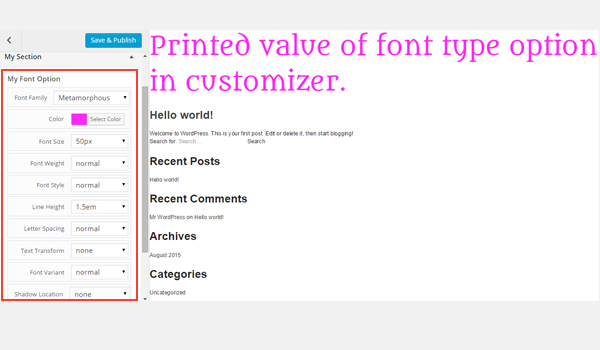 Printed value of font type option in metabox. The process of getting the values which I'm using here is somewhat complex. First get a unique instance via the getInstance() function in line #3. Next, retrieve the saved value via registering the ID aa_mb_font inside the getOption() function as a parameter (line #11). Now, aa_mb_font is not an ordinary ID—instead it holds a complete associative array of our font options. I saved this associative array in a new variable $aa_mb_font1_array. Line #14 validates the presence of an array inside variable $aa_mb_font1_array and checks that it is not empty. This step is important because we don't want to end up with fatal PHP errors by outputting an element of a variable which is not even an array in the first place. Sometimes when the user has not saved any value from the dashboard and you have not set any defaults, this getOption function gets NULL. For this purpose, a check-based statement is used. If it is an array and is not empty, then it puts a TRUE value, or else if it is not an array and is empty then it sets FALSE as the value of $aa_mb_font1_val. $aa_mb_font1_array is not an empty array, but instead it has elements in it. The net result is that line #11 has successfully retrieved its contents. $aa_mb_font1_array is not array, or $aa_mb_font1_array is an empty array and has no elements in it. The net result is that line #11 has failed to retrieve its contents. This was an overall validation of the font array. Now I'll extend this process to individual array elements. Lines #21 to #27 get the values of individual keys in the associative array and define a default if no value exists. For example, line #21 explains that if the defined condition holds TRUE, which means a value exists, then fetch the color of an array and save it in a variable $aa_mb_font1_clr_val. If no such value exists then set the value to red, which is default in this case. There are a number of ways to work around this, so it is just one of the ways I like. In short, if a user has saved any new font color from his or her dashboard then the selected font color appears; otherwise red is shown. I'd recommend setting the default options while setting the font to avoid any such problems. The same explanation applies on lines #24 and #27, except for the fact that these lines validate the values for font-family and font-size. In the end, I've just written the code which prints the result at the front-end. In lines #38 to #48, a div is created in HTML. Then I echoed the values of all the desired variables via inline CSS styling. You can now try out some new settings yourself. Let's create this option inside an admin tab, but with a different approach. 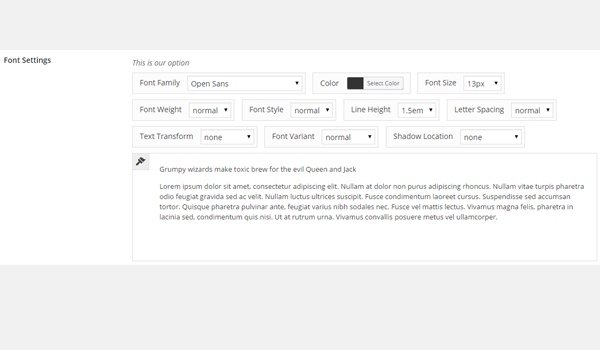 This time I am adding a font type option but allowing only a few style fields to appear. The unique ID of this option is aa_font_in_tab1_panel2. Look at the parameter list and you'll find out what makes this code different from the previous one. I've changed the default values of several check-based parameters to false. This means that all style fields of lines #13 to #19 will not appear. 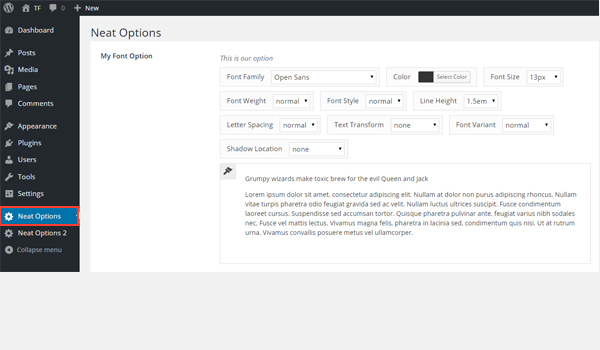 Also note the presence of default values for the styling options like font-family, color, line-height and font-weight. A font type option named My Font Option exists in Tab 1 of admin panel Neat Options 2. If you want to learn how this admin tab was made via Titan Framework, then skim through the previous articles of this series. In the above screenshot, the font menu appears less detailed in terms of styling fields. The reason is quite obvious, i.e. the false status of a number of parameters in my code. Notice one other thing: the default values of options are set automatically, i.e. 'font-family' => 'Arial' and color => 'red'. Did I skip any detail? Yes! I'm sure you must be wondering where the default values of line-height and font-weight went. Look again at the parameters list and you'll find the values of show_line_height and show_font_weight are set to false. This means that no matter in what capacity you define a parameter, it will only work once set to true. The sole purpose of adding these two parameters was to explain this concept. For now, you can omit these as well. Printed value of font type option in tab. The difference between the two settings is quite obvious. In the end, let's create this option inside the customizer. A font type option with ID aa_sec_font exists inside a theme customizer section $aa_section1. It appears with the name 'My Font Option'. The rest of the parameters are same. You can find this option in the theme customizer section named My Section. Printed value of font type option in customizer. Once again this code is exactly the same which I wrote in the case of an admin tab and a metabox. Only the variable names and IDs are different. So, refer to the detail written above. Let's take a look at the live preview of the changes which I made. 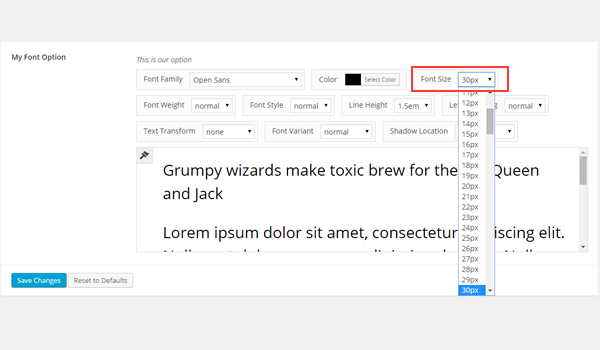 In our discussion on the font type option in Titan Framework, we learned that its CSS parameter behaves somewhat differently as compared to other options. 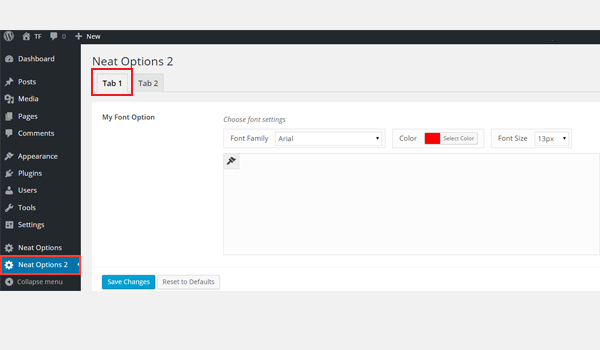 Today, in this article, I'll show you how you can automagically generate CSS of your font type option in a custom admin panel or even in a theme customizer section. 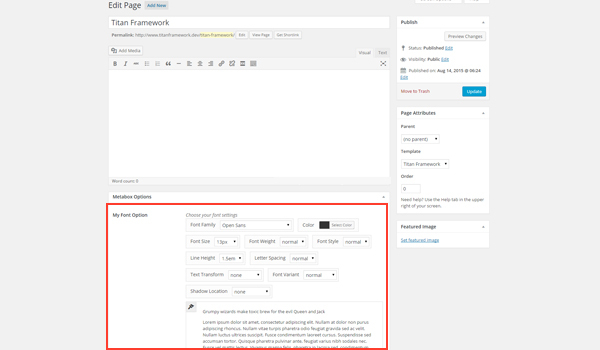 Generally speaking, css is a string type parameter, so if you set it, it can automatically generate CSS each time a Titan Framework option is created inside an admin panel and/or theme customizer section. 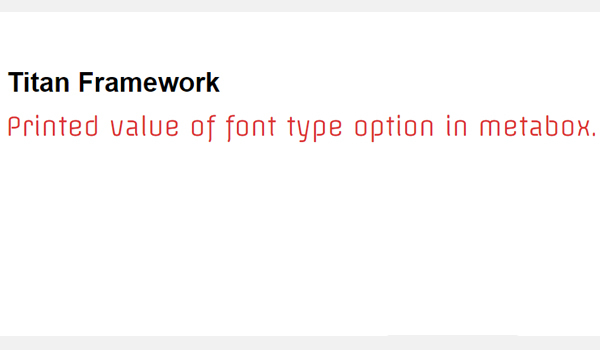 We know that a font type option in Titan Framework is basically an associative array which carries a range of style fields, e.g.color, font-family, font-size, etc. 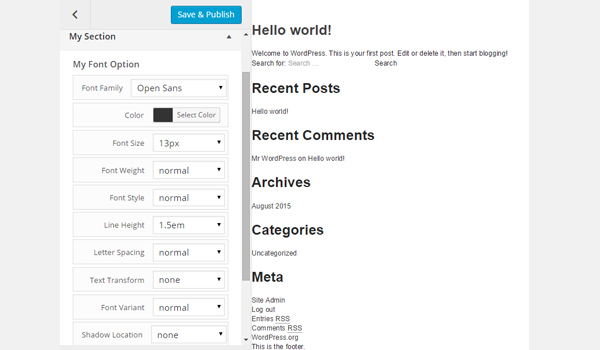 Likewise, it may happen that you use the same styling properties in some other place in your theme or plugin. Writing this many options in the css parameter can be a repetitive and time-wasting task. When you are not using some of the properties, what then? 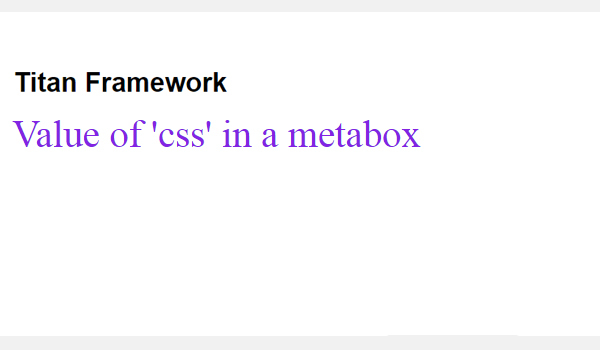 Note: The scope of this article deals only with the usage and behavior of the css parameter with the font type option in Titan Framework. If you want to learn how these containers are made or how to add a font type option in Titan Framework then refer to my previous articles. 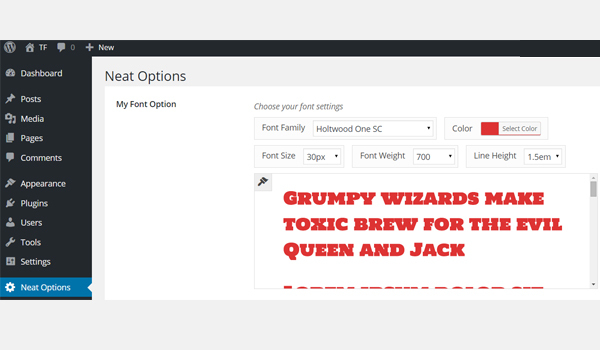 This code creates a font type option in an admin panel $aa_panel with limited styling fields. The ID of this option is aa_font. All the parameters (lines #13 to #17) where the values are set to false won't appear. I've also added default values for the font-family, color, line-height and font-weight settings. Line #24 defines a css parameter for a class named .aa_site_font1. Note that within this class definition, I've only written value. This means that all the CSS which this field will generate will be placed where value is written. So, wherever this class is used, it loads the CSS properties automatically. The above screenshot shows the current font settings and makes it clear that this option is created inside my first admin panel, i.e. Neat Options. 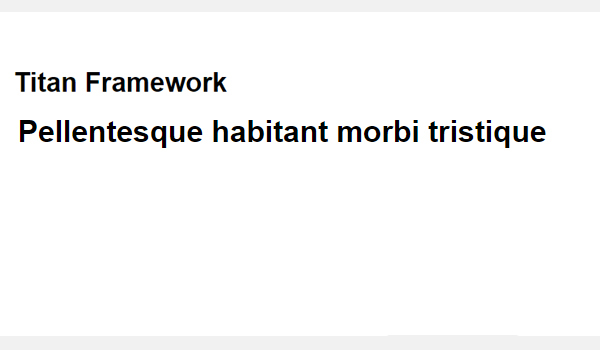 Let's create a div tag with aa_site_font1 class and see the result at the front-end. If you look at the code above, we provided the css parameter of the font field a class where it should output the CSS results, and that class was aa_site_font1. So, I went ahead and created a div with class aa_site_font1, to display the results at the front-end. Now let's change our default settings and make this font bigger and red in color. The new changes appear at the front-end like this. Remember it is just a div at the front-end with the CSS class aa_site_font1 in it, which we used inside the css parameter. This is how you can add a css parameter inside a font type option. 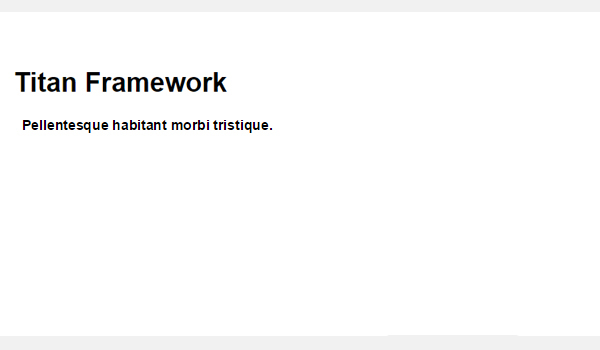 Titan Framework will automatically generate the CSS for it in your theme. 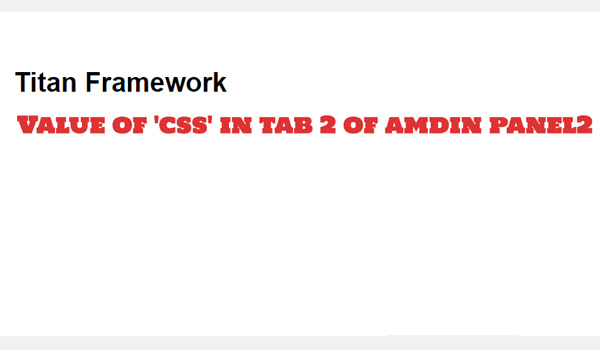 This time, I added the css parameter with class .aa_site_font2. It is defined inside a font type option which has all the style fields inside it. 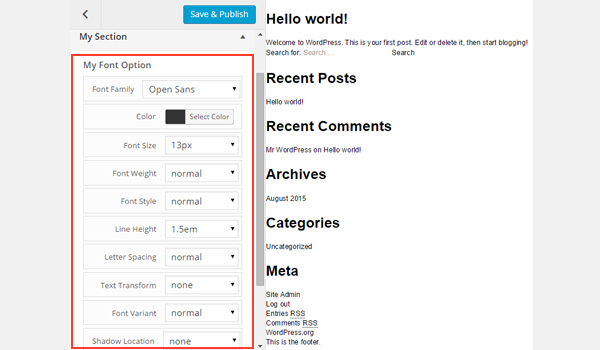 The above screenshot shows this option in a theme customizer section $aa_section1. Also, look at the settings which are currently set. Once again I'll show the use of styling properties of class aa_site_font2 in some other place, e.g. in a metabox which appears on all post and page editing screens. Again I have a div with the class aa_site_font2. There is some dummy text inside it, but ignore the text and look at how it is automatically getting styled. That's all about using the font type option with Titan Framework. I've explained almost every aspect of this option in detail. Titan Framework is definitely an intuitive script that allows you to build a cool set of options by still being lean and mean. Don't overuse these options—remember the "decisions not options" philosophy. Try out this option and post your queries in the comment box below or reach out to me on Twitter.